This ambitious 1995 release features some of Italy's more adventurous jazz modernists along with the somewhat surprising guest appearance of American rock & roll legend Robbie Robertson who provides a spoken word narrative on one piece. 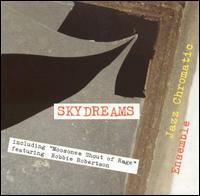 Essentially, this large ensemble pursues feisty, big-band-style horn charts in conjunction with pumping rhythms, variegated textures, and complex time signatures to coincide with off-kilter themes, dashes of electronica, playful pandemonium, and electric guitarist Roberto Cecchetto's psychedelic persuasions. Pianist Umberto Petrin's minimalist composition titled "Ritratto" boasts a memorably melodic and softly stated hook atop a subtly climactic horn arrangement, whereas the band serves up punishing choruses along with blues-based lines and ardent soloing on the enticingly provocative piece "New York Dreamer." However, Robbie Robertson's austere narrative provides a paradoxical contrast to the band's radiant horns and spirited proclamations on the composition "Moosonee Shout of Rage." "Skydreams" is a thoroughly enterprising effort as the 30-minute title track is all about fragmented sequences stitched together and performed at an altogether dizzying pace. Overall, the band does sustain a high degree of interest as they incorporate vigorous soloing, lush melodies, and affable motifs into their cleverly constructed and expertly executed repertoire.